A particular and charming way of living defines the “Adirondack Great Camp” culture. Although culture is a combination of style, attitudes, behavior, tastes, and knowledge, the most significant element of the Adirondack Great Camp culture is harmonious woodland architecture. The original Great Camps started as simple tent camps, but the use of log construction, native stone work, decorative twig and branch rustic work, and self-sufficient, multi-building complexes eventually institutionalized the style known today as Adirondack Great Camp. This architectural style was made famous by industrialists and financiers who built expansive vacation homes throughout the Adirondacks from the end of the Civil War to the beginning of the Great Depression. The birthplace of the Adirondack Great Camp is Raquette Lake, in the central Adirondacks of New York where W.W. Durant built the first Great Camp in 1877. Over the years, industrialists and financiers were joined by artists and philosophers from Ralph Waldo Emerson to Kate Smith. 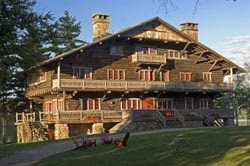 Many of the Adirondack Great Camps are still in use today and offer public lodging such as the Great Camp Sagamore pictured here, built by the Vanderbilt family in 1901. Privately owned Adirondack Great Camps become available for purchase occasionally and some of the new Great Camp construction is authentic and stunning. Adirondack Camp culture is more than a style of building however. ‘Going to camp’ means leisure time and slowing down. From the simple tent colony beginning to current days, artists have found their muse and business people have found rejuvenation at camp. There is an indescribable feeling of being on your own once you arrive at a camp accessed only by boat. This remoteness lends itself to planning and self-sufficient behavior not even considered on the Upper East Side of Manhattan. Even camps with road access impart the feeling that everything you could possibly need is already there. A result, I am convinced, of being surrounded by nature and natural materials. In addition to enjoying outdoor recreation in the late 1800s, a voracious reader was a happy camper. As technology advanced, so did camp life. Modern day Adirondack Campers enjoy television, cell service and even broadband internet service. This has led to Adirondack Great Camp residents who, like me, enjoy Adirondack rejuvenation and inspiration on a year-round basis. If you’d like to learn more about the Adirondack Great Camp culture, or camps currently available for purchase, please feel free to drop me an email. There are a few classically designed, old and new, camps currently on the market that are works of art in their own right. Weather Watching Time in Lake Placid!